The theme of this week's competition is ribbons or a ribbon, this can be ribbons of light, a ribbon of water running through the landscape, dress makers ribbon, anything ribbon like in fact. Hope you enjoy! The usual rules apply and the winner to set and judge next weeks competition. Firstly, I think all of these are great, interesting images with good purpose and execution, so as is often the case selecting a winner this will be difficult and probably involve a good deal of personal preference. I’ll try and give a short commentary on each, as Michael did, but I can’t promise the same level of insight. This is a really evocative image and a powerful example of capturing the decisive moment, an instant later and it would be gone. I assume the ribbons are the soldier’s medals, which is a nice interpretation. It’s sharp and the use of black and white removes any distraction that colour might bring and lets us focus on what’s being held by the elderly woman and the emotions in the faces of all four people. II wonder if the white vignette distracts from that focus a little though, as my eye is also drawn towards the white in the scene and I wonder if a dark vignette would increase the focus on the subject. That notwithstanding I think this is a very moving image and capturing a decisive moment like this is a difficult thing. The ribbons of light from the sun and the silhouetted nature of the branches create a nicely abstracted image and I like the fact that there is no way of knowing which way up the image is. I also like the way the light shines through the leaves giving a lovely green glow, which only happens with new spring leaves. The only things I might have done were to slightly darken the sky in the bottom right, to keep attention on the light rays - maybe in post processing by slightly reduce the luminescence of cyan, although without doing it I’m not certain if that would work. The other thing that might have had an interesting effect would have been to decrease the aperture as that might give even more of a starburst effect. Of course, you may have done that and this may have been the most pleasing result. I like this and note that I have never been mastered Intentional Camera Movement, or even got a usable picture out of it but I think this really works, creating an abstract image with strong colours and cohesive shapes. I also like the progression of colour and light through the image. I love the idea of this, making art out of something mundane that just lies around in the backs of PCs. Having tried my hand at some macro photography I know this is a very technically accomplished shot, the focus is pin sharp throughout and the lighting is perfect and leads you through the image, which is beautifully and simply composed, the curves and implied movement work perfectly. I can see it was shot on a K-1 and you don’t mention it, but I wonder if you used Pixel Shift Resolution - it would be a perfect subject for it. I do keep returning to this image though, my eyes just like looking at it. A nicely observed shot, I like the range of colours, with the dotted ribbons providing a change in texture. At first I couldn’t decide if I found the out of place blue ribbon towards the middle distracting, but on returning to the image I think it adds interest rather than distracts. The only thing I might have done was crop the image, changing the aspect ratio, to reduce the grey background above the ribbons. What an interesting and unusual thing, I had no idea it was possible to read a cassette tape visually. The image is nicely framed with a crop and is sharp most of the way through the image, though given the size of the subject and photographing at a macro distance, I think it would be difficult to get it sharp throughout without stacking multiple frames. I also like that you can see (I think) a distorted reflection of the photographer towards the top of the magnetic tape viewer. It’s quite an intriguing image as it’s representing the musicians’ art in ways they probably never expected. 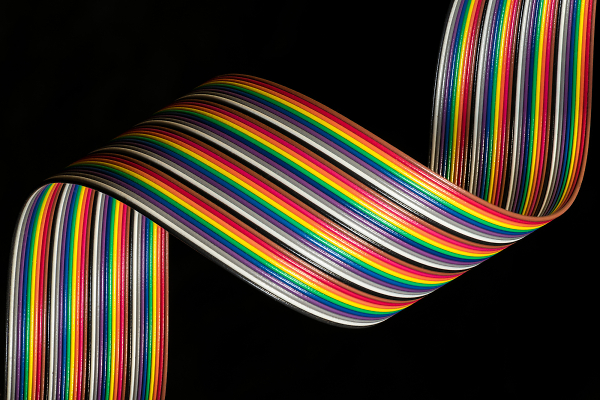 So, first place for me goes to Ribbon Cable for technical ability and simple, pleasing composition. Finding third was harder and was a choice between Magnetic Ribbon and Funfair Buzz. After some thought, I think the ICM in Funfair Buzz is more ribbon like and so that gets 3rd, but I did like the invention in Magnetic Ribbon, so I guess that’s an HC. Many thanks poliver for such a good, well managed competition that I felt should have attracted many more entries. Many thanks also for the win . I have to admit I have not tried pixel shift so following your comment I will have to have a go. If anyone is interested you can see how my image was shot here. Congratulations for my fellow podium members, i-Berg and JAK, MikeInDevon with the HC for his intriguing device and everyone else for a small but wonderfully diverse set of images. I will have a think and post up the next subject shortly. Thank you for the 2nd place and the comp, very happy with that. Congrats to Glyn, John and Mike also. Hi poliver, many thanks for the HC, I greatly enjoy the variety of images these competition generate. Congratulation to the podium winners, excellent material. Yes the reflection is me trying my best to keep as still as possible as it was hand held at 1/13 sec! The image shake reduction did its magic. A hearty congrats to GlynM, wonderful image and execution, colorful minimalist at its best! And extended to i-Berg and JAK, with MikeInDevon for the HC. Interesting challenge, and agree, should have attracted a lot more entries. Thanks Poliver for the challenge, comments and critiques. Btw, had thought of cropping, but the sharpness is not up to scratch, hand held with low indoor light does that. I should have used a tripod, but it was a shop, and some owners don't like all that paraphernalia in their shop. What a varied selection of entries. It certainly wasn't comparing like for like to select the favourite. Thanks for the 3rd spot and well done to Glyn, i-Berg and Mike. It's a shame this wasn't better supported as surely it wasn't that difficult to find some subject matter for it as the variation of subject matter in the entries showed. Well done to poliver for a first judging session well executed.